In 2016, a Congressional Gold Medal was presented in recognition of the Monuments Men. Below highlights just a few of these heroes with their accomplishments seen on Capitol Hill, from the outside of the buildings to the rooms and artwork within. Under enemy fire, Monuments Man Roscoe DeWitt preserved the artistic and architectural treasures of Europe during World War II. 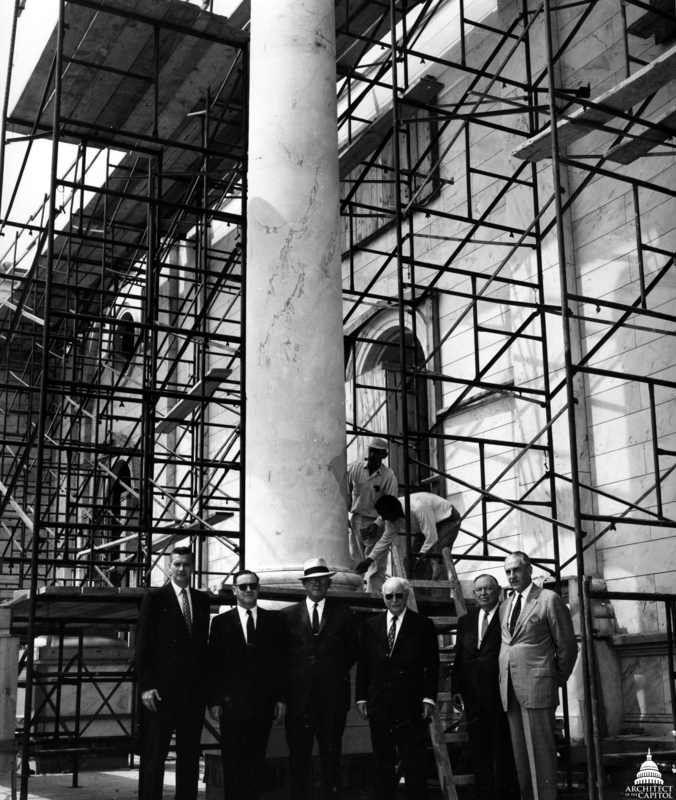 DeWitt, an architect, then returned home to be a part of a monumental building that would house some of the cultural treasures of America—the Library of Congress James Madison Memorial Building (pictured above is DeWitt, second from right, discussing materials for the exterior of the Madison Building in 1970). 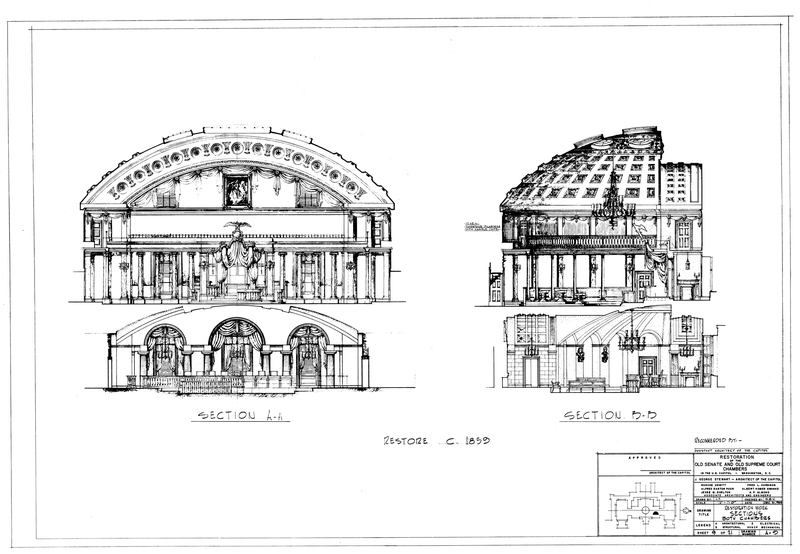 DeWitt's architecture firm was regularly selected for such iconic projects, having designed and constructed the extension of the East Front of the Capitol, which faces the Library of Congress and Supreme Court buildings. This extended the Capitol facade 32 feet 6 inches east of the old front, faithfully reproducing the sandstone structure in marble. 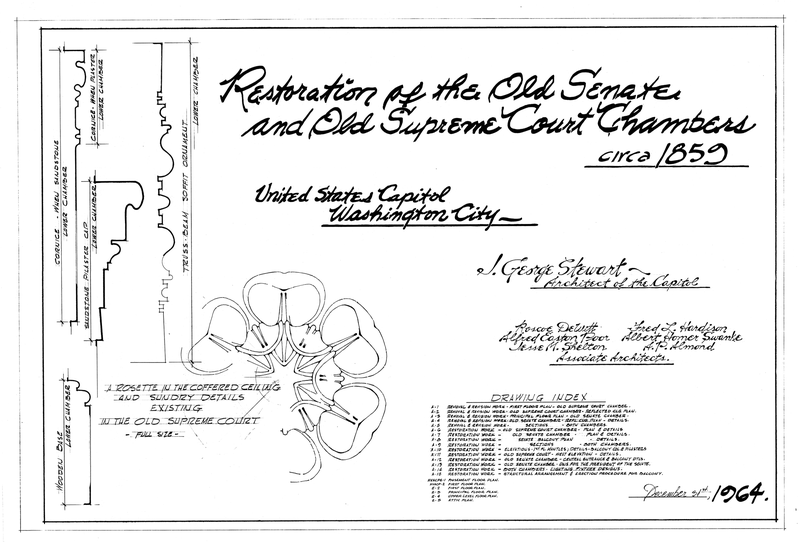 Architectual drawings and signature from DeWitt's firm. Behind the new Capitol facade, DeWitt's firm restored the Old Senate Chamber and Old Supreme Court Chamber. On the West Front of the Capitol, they also strengthened, renovated and preserved the material facing the National Mall, replacing some of the original sandstone with limestone. This work helped preserve and protect the artwork within the Capitol, some of which was created by fellow Monuments Men Deane Keller, Sheldon Keck and Walker Hancock. Keller was an art professor at Yale and a well known portrait artist, sometimes referred to as the "unofficial portraitist of the Yale faculty." During World War II, Keller was part of the team that returned museum treasures to the city of Florence and saved 14th and 15th century frescoes in the Campo Santo, alongside the leaning tower of Pisa. 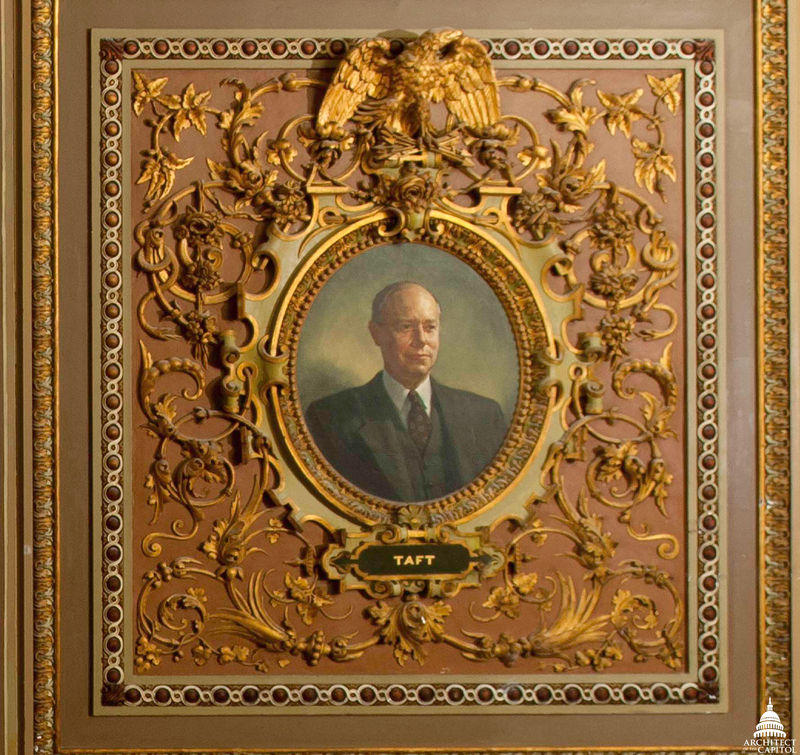 After returning from Europe, Keller continued teaching at Yale and was commissioned to paint a portrait of Senator Robert Taft for the Senate Reception Room in the Capitol. Robert Taft portrait by Deanne Keller. Keller's portrait of Taft greets visitors to the Senate as they enter the Reception Room before proceeding to the Chamber. It depicts this widely respected Senator with a slight smile, a welcoming presence in an ornately decorated space. After Keller created this new portrait in the Capitol, Keck was brought in as a consultant conservator for the restoration of one of the original portraits of George Washington, which hangs 180 feet above the floor of the Capitol Rotunda in The Apotheosis of Washington. 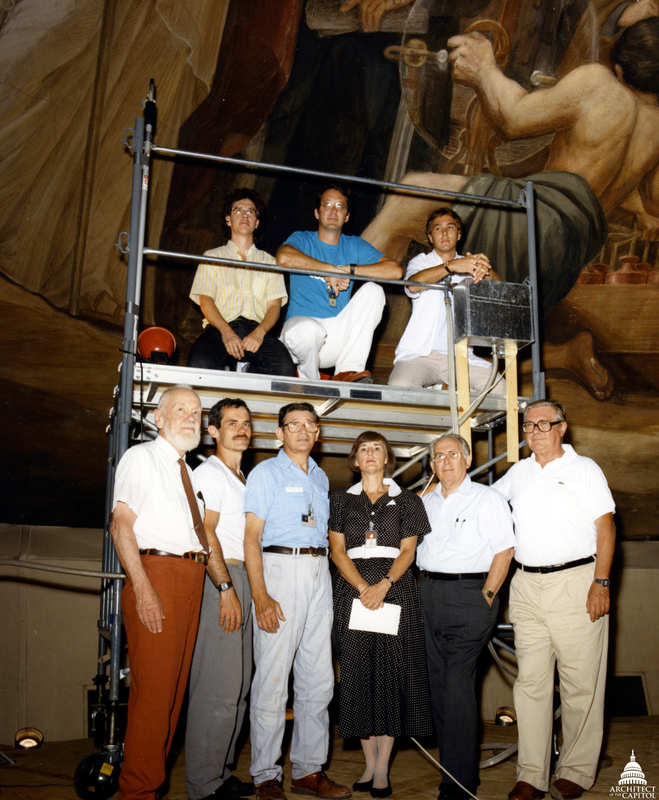 Keck (front left) worked on The Apotheosis restoration alongside his son (front second from left), who Keck had trained after his return from World War II. Keck continued serving the art world as he had as a Monuments Man, training nearly 150 conservators in art preservation and restoration techniques. This work was no less important than Keck's during World War II, although it was far less harrowing. As a Monuments Man, Keck served for a time with an architect friend of DeWitt, Walter Huchthausen. Huchthausen organized the emergency damage control of the Aachen Cathedral, the oldest church in Northern Europe and the resting place of Charlemagne, which was badly damaged by bombing. According to the Monuments Men website, "During the spring of 1945, Huchthausen and Keck made trips into the cities surrounding Aachen, and into the Netherlands, to inspect reports of looted works of art, assess damage to historic buildings, and note those monuments in need of repair. On one of these trips, Huchthausen and Keck accidentally ventured into unsecured territory and came under enemy gunfire. Huchthausen was killed immediately, but his slumping body shielded Keck and saved his life..."
"A few months after Huchthausen died, Monuments Man Capt. Walker K. Hancock [sculptor of the Madison statue] wrote in a letter to his wife, 'The buildings that he [Huchthausen] hoped, as a young architect, to build will never exist ... but the few people who saw him at his job — friend and enemy — must think more of the human race because of him.'" Dewitt, second from right, at the setting of the first column for the Capitol's East Front extension. One can easily imagine that Roscoe DeWitt thought of his late friend, Huchthausen, as he built the buildings that house our democratic institutions and protect what the Monuments Men fought and died for—our cultural heritage and our democracy. These buildings are monuments to these few brave men who went willingly into enemy fire to preserve the history and art of the human race. It is our honor at the Architect of the Capitol to preserve them for future generations, as the Monuments Men did for so many others. Perserving memories is such a big thing. I know that I will always want to be remembered when I pass away. I also believe that marble is the best way to keep things nice.